When Dale Earnhardt, Jr. held the grand opening for his bar, Whisky River, ESPN wanted to capture the night's events, including a performance by special guests Dierks Bentley, and a pre-show interview with both Dale and Dierks. Per ESPN's request, we used 2 Sony XDCAMs with time code jam-synced between the cameras and an audio rig that recorded discreet multi-tracked audio to an independent hard drive. Dedicating one camera to coverage of Dierks and the other to b-roll, LiveShot Carolina produced concert footage which edited cleanly and met the network's standards. When Fox and Friends wanted to feature Charlotte Mayor Anthony Foxx as part of their discussion on the country's debt ceiling and its impact on local governments, they chose LiveShot Carolina. Our proximity to Charlotte's Center City easily enable the Mayor to participate in discussion without wasting precious minutes of his workday. For the staff which accompanied him, we provided our green room both before and during the interview, thus allowing them to conduct business and keep the Mayor on schedule. 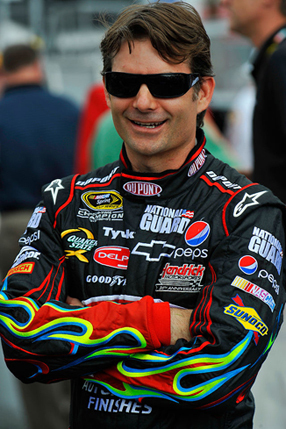 When EA Sports created the video game Nascar '09 with Jeff Gordon, ESPN conducted several interviews with Jeff for their shows Sports Center and Nascar Now. Because of the tight schedule maintained by Jeff, these interviews had to be shot live on location at the sound stage being used for the EA Sports shoot. Without any connectivity at the venue, we were contracted to shoot and uplink the interviews to ESPN in Bristol, CT. This allowed producers to to add Jeff to their show, despite his time constraints.